This till lock utilises 10-pin radial key security rather than a traditional straight cut key, making it difficult to pick and therefore a popular choice for cash register / till security. The cylinder diameter is a standard 16mm so should retrofit the majority of applications using camlocks and other cylinder type furniture locks. 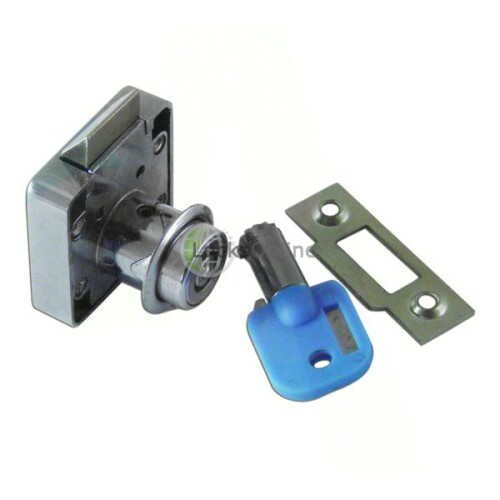 Another unique attribute of these till locks is that unlike many others, they actually come with an optional metal strike plate, so if the till has been damaged either by attack or by general wear and tear over the years, you can fit the strike plate to allow the lock to work again, and to prevent wear on the till. It also allows it to be used in a whole range of situations not just tills! These can be used for applications such as wardrobes, medicine cabinets, drawers, the possibilities really are quite endless purely down to the metal strike plate being included. This is what most of us know locks to be - your key fits your one lock, but doesn't fit a different lock you have. So you end up having to use two keys. 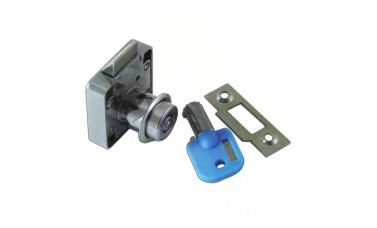 In most applications this is great, as you wont generally need multiple locks to work off the same keys. This means that all of the locks within the order will all work off the same keys. So if you have multiple tills or multiple shops and you wish for your keys to work on all of them, this would be an ideal solution for you. Extra keys are available but due to the complex nature of 10-pin radial keys, if ordering extra keys please allow an additional 3-5 working days for completion.